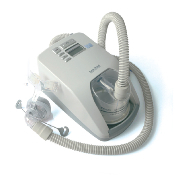 The SleepStyle™ 242 CPAP with Humidifier offers a comprehensive range of standard, enhanced and truly integrated CPAP devices with usage recording capability and SmartStick Technology. The strongest differentiators in the SleepStyle™ 242 CPAP with Humidifier is the Ambient Tracking™ Plus auto-adjusting technology and SmartStick Technology. The SleepStyle™ 242 offers SmartStick™ Technology along with a compliance metric and efficacy reporting The SmartStick™ utilizes USB technology and provides convenient 2-way removable media to view and update settings. ComplianceMaximizer™ software for CPAP and humidifier usage and performance data reporting for clinicians and providers. This software meets the insurance and Medicare compliance data reporting requirements. SleepStyle™ 242 CPAP with Humidifier includes patient manual, 2 standard water chambers or 1 optional dishwasher safe chamber, connector, 6ft tubing, air filter, water funnel and carry bag.